Nasal pillows are an alternative for people to use instead of full and partial CPAP masks. Many feel they are more comfortable than masks. Educating yourself on the use of nasal pillows with your CPAP machine will help you use the product successfully and get a good night's sleep. Nasal pillows fit right at the opening of your nostrils and inflate to create a seal so the right amount of pressure is maintained. This mask will work with lanolin cream or a nasal lubricant. It is recommended to put a bit on at the opening of your nostrils to prevent soreness. Nasal pillows and nose pads are two different types of masks. A nose pad is a type of mask that goes over the entire nose. The nasal pillows go at the opening of the nose. Even though nasal pillows are considered a mask, it doesn't have any mask in the sense that nose pad masks do. It just contains the device that goes right under the nose and at the opening of the nostrils. The seal is created right at the nostrils, whereas with the nose pads, they go over the nose and the seal is created on your face around your nose. According to the Journal of Clinical Sleep Medicine, some people may not be able to use nasal pillows because they need their CPAP machines at a high pressure, and nasal pillows should not be used at high pressures. However, as it was discovered, using the nasal pillows at lower pressures ("≥ 12 cm H2O") was just as effective as using a mask at higher pressures. You can discuss these findings with your doctor as you work to titrate the right amount of pressure for your machine and accommodate it for the nasal pillows. 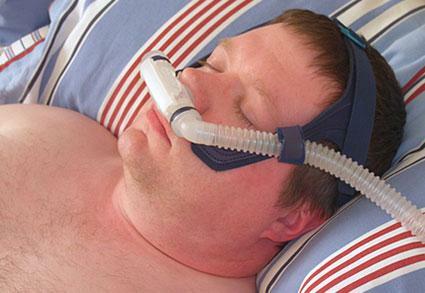 Any mask or device can be used with your CPAP machine, including nasal pillows. On CPAP.com, a wide variety of products are available for nasal pillows. It's important when choosing CPAP pillows to choose a system that is comfortable for you to wear. All nasal pillows come with head gear to hold the nasal pillows in place. The head gear goes over either the top of the head or the back of the head. Choosing the most comfortable option for you will help you use it consistently. Learn how the nasal pillows work. First put the nasal pillows against your hand to see the device in operation and feel the pressure it will create to help you breathe through your nose. Put the pillows at the edge of your nostrils. Don't put on the head gear yet. Turn the machine on and feel if the pillows inflate with air and give it enough seal so it stops the air leaks. Take advantage of the adjustable capabilities. Put on the head gear, then adjust it in your sleeping position. Use a hose hanger. This will help take the weight of the hoses off the nasal pillow so they stay in position and not get pulled away from your nose. If your nostrils are sore, you may have the head gear on too tightly or the nasal pillows are too far up your nose. Many users of CPAP masks feel that over the nose, over the mouth, or masks that cover both are too stifling. Nasal pillows have the least amount of contact with the face and allow a wider range of freedom for nighttime movement while sleeping. Nasal pillows also will help men with facial hair who have trouble getting a face mask to seal properly. The TAP PAP Nasal Pillow Mask is just one of many different types of nasal pillow masks and demonstrates the advantages of using a nasal pillow mask. Sore nostrils and dry nasal passages seem to be the primary complaints for nasal pillow use. Dry nasal passages are a common complaint for any sleep apnea mask. However, sore nostrils can happen when a nasal pillow is too big or ill fitted for the nostrils, and sometimes create sores where the nasal pillow rests. The American Sleep Apnea Association points out that some people are mouth breathers, which can be due to sinus problems. Sometimes the sinus problems are due to the CPAP machine, which can cause dryness or congestion. Mouth breathers might either have to use steroids to open up the sinuses, or they might have to wear a mask that covers both the nose and mouth. Any changes you make should be verified with your doctor. Moreover, your doctor will be able to help you obtain a CPAP mask, since they cannot be sold without a prescription from a doctor. When you do get a prescription from your doctor, make sure the prescription does not have one specific size written, such as medium sized, so that you can get the three or four nasal pillow sizes that come with nasal pillow masks. Being able to get all the sizes will allow you to experiment with the different sizes. The right fit is essential to prevent nostril soreness or nasal passage discomfort from not being able to maintain a good seal.